This disease appears to be quite common in public aquaria and yet remains undescribed to date. It is commonly refered to as Green Boring Algae Disease, however no one knows what really causes this. Boring patterns of two marine Cyanophytes, Mastigocoleus testarum, and Kyrtuthrix dalmatica, which actively penetrate carbonate substrates have been described by Golubic and Le Campion-Alsumard as early as 1973, however these species have not been directly linked to the disease reported by the reef keeping communities, see links below for more details. Fork and Larkum 1989, talk about a further algae from the genus Ostreobium sp. which is reported as a shade loving coral symbiont. 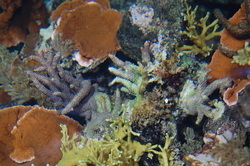 It may be likely that the algae does not cause any direct damage to the coral itself, but simply colonizes the skeleton of corals suffering from other diseases. In support of this, Fine et al., 2006, showed that following the rapid lesion progression of white syndrome in tabular Acropora spp. in the wild, the bare skeleton gradually changes to green. In this study, they linked this change in color to numerous endolithic algae blooms (primarily Ostreobium spp.). Endolithic algal biomass and chlorophyll concentration were found to be an order of magnitude higher in the green zone compared with healthy tissues on the corals. 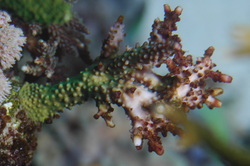 Two species from this genus have been linked to corals so far O. reineckei and O. constrictum (Lukas 2008). As the likely visible cause of this syndrome is cyanobacterium similar to that reported for Red Slime Algae and Black Band Disease, similar treatments as proposed for these diseases could be utilised. To recap commercial products such as Ultralife Red Slime Remover, Boyd Chemi-Clean, and Blue Life Red Slime Control (Brang, 2010) might work. However, again, many of these diseases are reported as a sign of poor water quality, so most aquarists propose reassessment and improvement of aquarium water quality (reducing levels of nitrate and phosphate and monitoring light levels and improving flow) as the most effective treatment. Look at the BBD link for other potential options for treating cases of this disease and please report on here or to us directkly the effects of your treatments on any of the described diseases.